Yes, we’re serious. When I was asked (or, um, “volunteered”) to edit our Kwanzaa Week series, I was hype! Last year, I decided to try to celebrate the holiday for the first time in a long time. This was pre-Donald Trump, and my family and I admittedly bumbled through it, but now more than ever, this seems like the perfect time to “Make Kwanzaa great again”! Sure. This will be one of our shortest explainers ever. Why isn’t Kwanzaa already great (or even celebrated much), you ask? Well, for one, it’s work. It’s definitely a doing holiday. 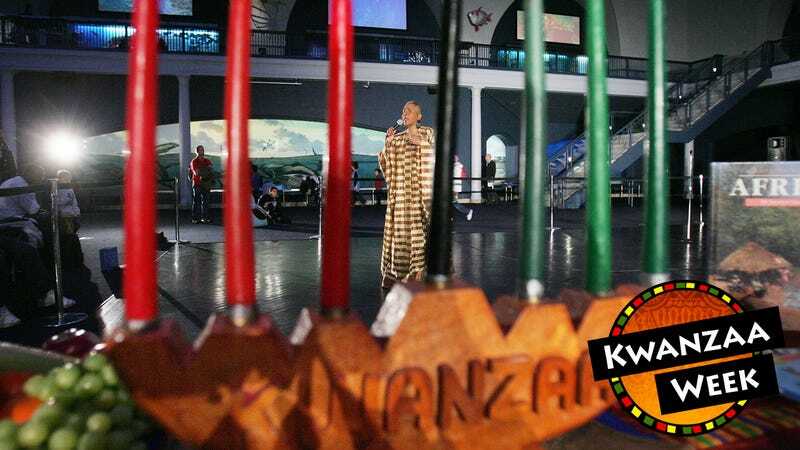 Kwanzaa is not only celebratory but also reflective. Two, the principles of Kwanzaa are radical in that they ask black people to celebrate themselves, in a country that has no black holidays—besides Martin Luther King Jr. Day, which is not cultural—even though we’ve been here since the country started and gave it all of its culture. Of course, there’s also the fact that Kwanzaa is not tied to pop culture, Black Twitter or Love & Hip Hop (maybe because commercialism is antithetical to its very definition). Kwanzaa is also not taught in schools, so, really, the only way you might know about it is word of mouth. And in the spirit of Kwanzaa, I’d like to give a special shoutout to everyone who pitched in for Kwanzaa Week, for embodying togetherness (Umoja), blackety-blackness (Kujichagulia), collaboration (Ujima), the work (Ujamaa), purpose (Nia) and creativity (Kuumba). Also, we acknowledge the faith (Imani) that our editor-in-chief, Danielle Belton, put in all of us when she put her team together this year.